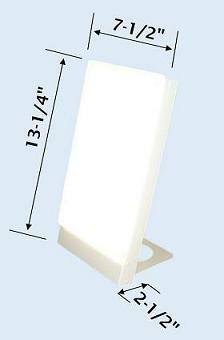 Northern Light Technologies SAD TRAVelite Travel Lamp Light Box. It fits in a briefcase. A compact and versatile light box that will let you enjoy the light in a variety of situations. Use it in the office, at home, on a trip. The TRAVelite comes with a versatile stand that allows vertical and horizontal positioning on a flat surface as well as shining up or down. Please give us a call (800)355-2956 if you have any questions regarding this item. With the TRAVelite, you get 10,000 lux at 10-12 in. (25-30 cm) and need to use the unit for 20-30 minutes. Sitting at 18 in. 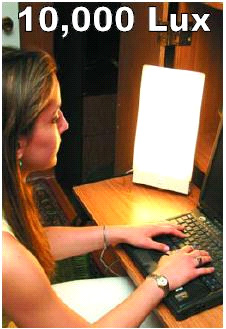 (45 cm), the TRAVelite delivers 5,000 Lux of light, and we recommend that you use the lamp for about one hour each day, preferably first thing in the morning, sitting as in the photo. The treatment works through the eyes, but you do not need to look directly at the light. The TRAVelite also comes with a 5 year warranty! Tips: Use the light regularly at about the same time each day. Also try to spend time outdoors during sunnyperiods. Eat sensibly, exercise and try to keep a regular wake-sleep hours.